Geraniums bloom profusely from early summer until frost, adding a splash of brilliant color to gardens or decks. These easy-to-grow plants require minimal care and can be grown in containers or planted directly in the soil. Lifting the plants and bringing them indoors for winter provides geraniums for the next season. Providing adequate light, water and occasional fertilizer throughout the summer and a little extra care during winter months insures healthy, robust plants with abundant blooms. Select a location that receives at least 6 hours of direct sunlight a day. Light shade in the afternoon during the hottest months (or in southern areas) is preferred. Keep in mind that areas that receive full sun in the spring may be shaded from trees in full foliage later in the year. Prepare soil by tilling to a depth of 8 to 10 inches. 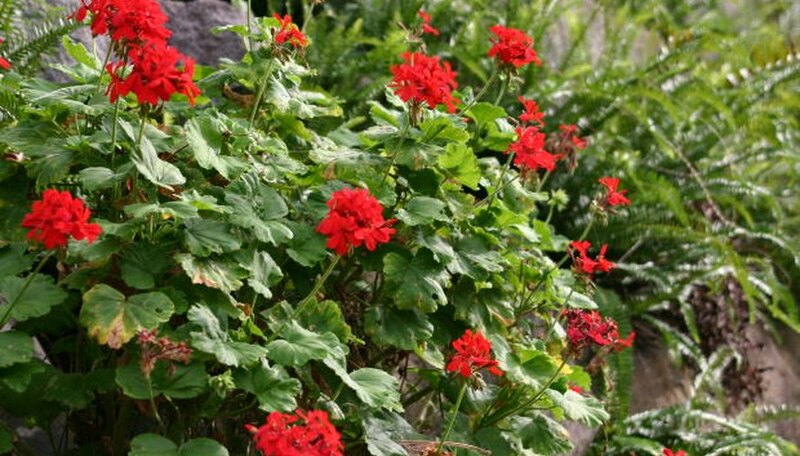 Geraniums prefer slightly acidic soil with a pH of 6.5. If you are unsure of the pH of your soil, purchase an inexpensive test kit at your local hardware store. Follow instructions included in the kit for adjusting soil pH. Add plenty of well-rotted manure or compost to increase aeration and improve the soil. Geraniums prefer light, friable soil rich in organic matter. Plant geraniums to the original soil level, and firm the soil around the base of the plant with your hands. Space plants 12 to 18 inches apart. Water thoroughly to moisten the soil to the depth of the root ball. If the geranium grows tall or leggy, pinch out new growth from center leaves. This forces new growth from the base of the plant and along the stem, creating a full, compact plant. Fertilize with a balanced fertilizer (10-10-10 or 8-8-8) once a month to promote lush green foliage and large, bright blooms. Water when the soil dries. A thorough watering once a week is generally sufficient under normal circumstances. During periods of drought or extreme high temperatures, they may require more frequent watering. Watch for signs of wilting, and adjust your watering schedule to meet the needs of your plants. Lift plants from the garden before the first frost to overwinter as houseplants. Shake to remove loose soil, and pot in fresh soil. Cut back two-thirds of the plant. Place in a sunny indoor location, and water to moisten the soil. Fertilize with half-strength fertilizer after two weeks, and repeat with a monthly application. Pinch often to encourage compact growth. Plant in the garden in spring after the danger of frost has passed. You can plant geraniums in containers or window boxes following the same procedures. You can propagate geraniums with stem cuttings and grow inside for the winter, if preferred. Geraniums grow tall and leggy if they do not receive adequate light.